SAN FRANCISCO — As they walked off the field late Tuesday night, the Giants were met with a startling new reality. They now lead the National League Wild Card race. For the first time since May 10, the Giants do not hold the top spot the National League West. A club that once led the division by eight games, lost 4-3 to the Pirates at AT&T Park a few hours after the Dodgers blew out the Phillies. A back-and-forth game was won by Jung Ho Kang’s solo homer in the eighth, long after two right-handers departed with the same starting pitching line. Both hard-throwing starters ran into trouble early but limited the damage. Two singles and a fielding mistake by Jeff Samardzija put three on in the first, but a double play held the Pirates to one run. They opened the second with a pair of doubles, but Samardzija again kept the rally to one run. The Giants got both their early runs off Jameson Taillon in the first. Denard Span and Angel Pagan opened the inning with singles and they cruised home when Buster Posey lined one into Triples Alley (he stopped at second). The teams exchanged productive outs in the sixth. Andrew McCutchen tripled and scored the go-ahead run on Gregory Polanco’s grounder, and a few minutes later Buster Posey scored from third on Hunter Pence’s grounder to short. The Pirates jumped back on top in the eighth, and did so in a surprising fashion. Kang smoked a 95 mph fastball from Derek Law over the center field wall, snapping Law’s streak of 19 consecutive scoreless appearances. Joe Panik's double put two in scoring position with one out in the bottom of the ninth, but Ehire Adrianza popped up and Span grounded out. Starting pitching report: Samardzija and Taillon posted the exact same pitching lines: Six innings, six hits, three earned runs, one walk, five strikeouts. Bullpen report: Law had not given up a run since June 30. He had held opponents scoreless in 25 of his previous 27 appearances. At the plate: Pagan extended his hitting streak to 14 games. 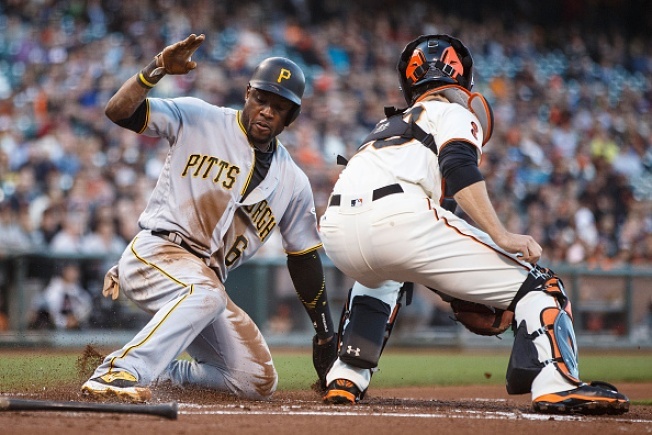 In the field: Kang’s homer could have been a two-run blast but McCutchen tested Posey’s arm. It was a bad idea. Attendance: The Giants announced a crowd of 41,185 human beings, including Andres Torres and Mike Fontenot. Up next: Matt Cain (4-7, 5.47) faces former Yankee Ivan Nova (9-6, 4.68).